You will see a key on a PC that does have it stored in UEFI (above); you’ll be informed that there is no OEM key if you don’t have one (below). 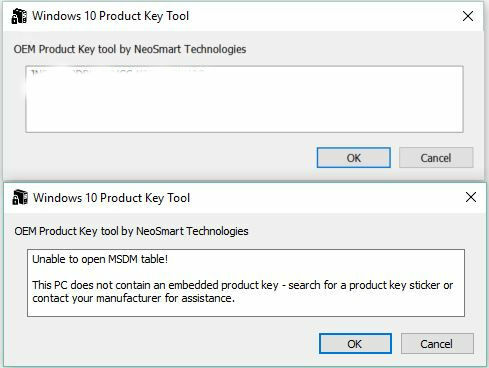 When do you need a Win10 OEM Keyfinder? In most cases, Windows will read the OEM key from UEFI on its own but that presupposes Windows is up and running. In situations where Windows is not available or driver issues impede an installation, it can be helpful to have the key around “just in case” (it can’t be accessed). That’s why I recommend running this tool before attempting any upgrades (if it won’t help you, the software will tell you) and recording the OEM key you find (where applicable). If you need, you’ll be glad; if you don’t, it won’t cost you much (nothing for the software and a very small amount of time). The utility is 1.38 MB in size and runs straight from the .exe so you can run it from your admin UFD (USB flash drive) without having to copy or install anything. The Windows 10 Product Key is working flawlessly. I´ll be sure to let my friends know about your awesome service! Activate Windows 10 Product Key by clicking here: http://www.CHEAPKEYSTORE.com/I activate my Windows 10 Product Key with the key here and works great.